An interesting development happened in that forum thread in the Assembly Hall section of the EVE Online forums arguing about the use of ISBoxer. Supporters of ISBoxer started to note, correctly I may add, that opponents of ISBoxer didn't have reasons for banning the use of ISBoxer except for "I don't like it." One opponent of ISBoxer, in the usual way of butchering logic of EVE Online forum trolls everywhere, pointed out that users of ISBoxer could circumvent the design mechanics of EVE. The "example" he used, once deciphered, was drone assist. "We have two big motivations for making a change to drone assist: improving gameplay and improving performance. As drone assist grew in popularity, it quickly became apparent that while it’s a very powerful tactic, it isn’t much fun, especially at large scales. Having hundreds of ships' worth of drones assigned on one trigger pilot relieved an enormous amount of people from almost any responsibility in fleet. "Now, EVE may not have the twitchiest gameplay around, but drone assist goes too far and testimony from frustrated pilots has been pouring in for a while now from all over. We feel that by limiting drone assist we significantly improve the chance of pilots feeling invested and responsible during fleet engagements (even if it means they don’t get to watch quite as much TV). "The second big incentive to make a change is that drones are relatively taxing for our hardware when compared to other weapon systems. That means the recent surge in popularity of drone assist has had a tangible, negative impact on server performance in some of the battles of late. While the balance between design goals and performance goals can be tricky, this is one of those nice opportunities where we can have a positive impact on performance without any design cost at all." CCP actually wanted to do away with drone assist entirely, but CSM 8 convinced the game developers that enough legitimate use cases existed that a 50 drone limit was justified. But a drone bunny using ISBoxer can get around the design limit of one pilot controlling 50 drones. An ISBoxer users running a small gang of 5 fast-locking ships can, with one keystroke, simultaneously attack a target with 250 sentry drones. In the past, CCP has come down hard on those who used software to circumvent game mechanics. In April 2013, Team Security banned 2,350 accounts guilty of using an autopilot warp to zero hack. That hack did violate the EULA in other ways than just circumventing the game mechanics, though. Of course, ISBoxer also violates the EULA, but CCP has stated that, "the multiboxing application is not something we plan to actively police at this time." "However, if any third party application or other software is used to gain any unfair advantage, or for purposes beyond its intended use, or if the application or other software violates other parts of the EULA, we may fully enforce our rights to prohibit such use, including player bans. Please use such third party applications or other software at your own risk." Given CCP Rise's explanation of why the drone assist cap was put in place, using ISBoxer to get around the cap would seem to violate the section about intentionally placing additional load on the servers (section 6A1 of the EULA). I don't know how widespread the practice is, but if anyone is using ISBoxer to circumvent the cap, I'd suggest they stop. Who knows when a spy might turn up and start turning people in to CCP. I've played MMORPGs for nine years, so I know better. Don't play a new game at launch. Wait at least 90 days to let the developer work out the bugs. But I just had to find out how C.R.E.D.D. would work at launch, so I violated the rule and pre-ordered Wildstar. Probably not the best decision I've ever made. My initial problems with the game were mostly my own doing. Carbine added two-factor authentication in the form of Google Authenticator. Google Authenticator? If Carbine had come up with their own app, I would have downloaded immediately. But I'd never heard of Google Authenticator before and was wary of how it worked and what getting the app would mean, so I delayed getting the app until I could do some research. Unfortunately, my account was hacked while I was at work less than 12 hours later. To add insult to injury, the hacker put Google Authenticator on my account so I couldn't get back in. That cost me two days. Okay, now I'm playing for a weekend. But the following Friday, I leave my iPhone at work. I'm not about to make the round trip into Chicago just to pick up my phone. Sure, my fault, but that was another two days not playing the game. Good thing I'd set up my computers at home so I didn't need the authenticator for logging into Google. Not playing because of my own stupidity, no problem. But last night was ridiculous. After playing EVE I decided I'd log into Wildstar for 30 minutes and knock off a couple of quests. So I downloaded the patch, logged in, got to the character select screen, and couldn't enter the game world. Apparently Wildstar misplaced my cryo-pod. Not just my cryo-pod either. A lot of people had the problem. Look, I know that MMORPGs have issues at launch. Having to log out every so often because the bruiserbot on my Engineer was bugged was irritating. Opening the AMP window on my Medic and seeing no tool tips, I was able to work around (I think). But creating a patch that introduces a bug that keeps a large number of people playing? That's really poor QA. Another thing I did last night was watch Alikchi stream Crusader Kings 2 on the TMC stream. I'd seen a video for the game on Steam and Alikchi's stream allowed me to check out the game for an hour. Alikchi is pretty good and I was interested in buying the game afterwards. Imagine my surprise when I checked out Steam for the latest bargains because I couldn't play Wildstar to find Crusader Kings 2 on sale for 80% off. Needless to say, I quickly snapped the game up. Now I'm in a bit of a quandry. I'm absolutely playing EVE this weekend because I need to do some practical experimentation of some theory crafting I did. But if I only have time for one other game, I may not choose Wildstar. The new car feel is wearing off fast. While I was following the forum posting of the CSM earlier this week, I ran into another thread on the EVE Online forums asking for the banning of ISBoxer from EVE. Instead of arguing the pros and cons of multiboxing software, though, I just want to point out the growing trend of game companies making decisions that are unfriendly, if not downright hostile, to those who wish to use multiboxing software like ISBoxer in games. Over the weekend, I decided to create a new character in Wildstar. Not because I needed another crafter to complement my first character or act as a mule. No, because my first character, and Exile engineer, just didn't feel right. I'd hit level 15 and about to do the quests in Thayd when I realized I didn't want to be a tank and the Exile story was getting pretty stale. So I created a Dominion medic and began the game again from level 1. Last night I hit level 5 and the story, for now, is much better. Rerolling a new character because I don't like my original class isn't something new for me. In EverQuest 2, I originally created a paladin before switching my main to a ranger. Guild Wars 2 saw me create a thief before rerolling as a ranger. Alright, I like ranged DPS. What can I say? Rerolling isn't so bad when the original characters are below level 20. But in Star Wars: The Old Republic, I wound up rerolling after my smuggler reached level 37 because the story turned so bad. That, more than any bugs or lag, killed the game for me. Of course, EVE Online doesn't have levels. In EVE, a character is defined by its skills, not its class. So if I want to do something else, like fly Gallente ships instead of Minmatar, I don't have to create a Gallente character; I just start learning the skills to fly Gallente ships. The same holds true for crafting. My industrial character can theoretically make anything once she learns the skills, although some things are better, and more easily, made with friends. No armorer or weaponsmith crafting classes in EVE. And I only have an industrial character because EVE allows me to train characters on multiple accounts at the same time, even when I'm not logged into the game on any of the accounts. But that's a discussion for another post. The skill-based system does have some benefits over the level-based one found in most MMOs. For instance, because learning new skills on an existing character or new character is basically the same, players will create fewer characters. Fewer characters created not only means fewer characters for the game to track, but less names used. Anyone remember the uproar when Wildstar's name reservation system didn't work quite right? Names are important to many players and the fewer good names on characters who never play the game, the better. But for me, the biggest benefit is that some of the core skills I learned, like Engineering, Navigation, and Mechanics, are good for anything I wish to do. Even Accounting comes in handy for players changing from a trading style of play to PvP. Paying less in taxes when selling items is always a good thing. So if I want to change the type of ship I fly, or even my style of play, I don't have to start from scratch, which I have to do in a level-based system. Don't misunderstand, a skill-based system doesn't automatically mean a game is so good I'll play for 5 years like I have EVE. While I enjoyed my time in The Secret World, another skill-based game, I never reached Egypt. And the fact that I'm playing Wildstar shows that level-based systems won't deter me from playing a game if the game looks interesting. But I do wish that I had more skill-based games to look at and possibly play. 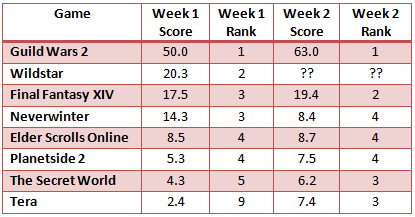 The rankings of the top twelve MMORPGs as determined by the players of the Xfire community from play on Sunday, 15 June 2014. For more details about the methodology, click here. Historical data can be found here. Sunday saw the Xfire community spend 7% less time playing its favorite MMORPGs than the week before. World of Warcraft (+193 hours) managed to buck the trend while Wildstar's performance (-500 hours) managed to lead the way for the second week in a row. Maple Story fell off the list, replaced by a game making its second appearance this year, Need For Speed World. One Cup To Rule Them All - This week's 7% decline in time played was probably due to the World Cup, which runs until 13 July. Respawn's graph showing the effects that the Uruguay vs. England match had on activity in Titanfall is just one example of the World Cup's effects on gaming activity. Looking at the 12 most popular MMORPGs in Raptr showed a 13.8% decline in hours played from the week before. Lighting The Way - Blizzard fought off the effects of the World Cup by lighting the bonfires of the Midsummer Fire Festival. Running from 21 June to 5 July, the event offers access to an event-only dungeon, two pets, and many special items. Staggering Along - Wildstar continues to suffer the bugs associated with the launch of a new MMORPG. Also, despite its first ban wave and the launch of C.R.E.D.D., the game is still beset by hackers, botters, and gold spammers. That combination hurt Elder Scrolls Online. Does Carbine have the capacity to quickly right the ship? I'm in the process of removing my co-worker from my EVE Online corporation. He hadn't logged in for a couple of months and he told me he was leaving. With the kids growing up and working a lot of crazy hours, he just didn't have time anymore. Oh, and he really didn't like the fact that players can lose their stuff in EVE. No one can say he didn't wander into dangerous grounds. His first loss was exploring in a wormhole and his second taking a Venture into low sec. I think those two experiences soured him on the concept of EVE's death penalty. Knowing that type of loss can happen intellectually and actually experiencing it are two different things. EVE's death penalty is one of the things that makes EVE a niche game. I think that one of the problems when other people log into EVE after playing other games is the concept of actually losing gear. To them, really good gear means something. To EVE players, our gear is almost all player-made and usually available in a trade hub for ISK. That's why the first rule of EVE is: don't fly what you can't afford to lose. For pilots of frigates and even cruisers, really good equipment is relatively cheap and, except for Catalysts during Burn Jita, usually readily available. The thought that struck me as funny this morning is that raiders in World of Warcraft or other games don't blink at the thought of paying massive repair bills. The effort of replacing a piece (or 7) or gear is what they find objectionable. They've already put in the effort, why do they need to put in the effort again? I know losing my first couple of ships in EVE was a pretty daunting experience because of the time involved replacing the ship. I was new and didn't have any backup ships already purchased and fitted. In other games, I died, rezzed, paid a repair bill, and went on my way. In EVE, I had to go shopping! A pretty good incentive to not lose a ship. Now, I have backups of my ships purchased so if someone kills me I can just go on my way. That happened the last time I lost a Procurer. The only thing I needed to do was take a few minutes to fit my replacement ship for ice mining instead of belt mining and I was on my way. Which was good, because I made a deal with the guy who killed me so he'd let me continue ice mining. I'd wager that a good percentage of those who PvP either already have a lot of ships ready to fly in case they lose their current ship or are in an alliance with a good market where the pilots can purchase replacement ships quickly. In effect, those players have pre-paid the death penalty (unless podded, and many don't mind that) and can treat their losses like players in other MMORPGs treat their repair bills. I think one tip experienced players can give new players is, if the player has a ship he/she likes, to purchase and fit a second one, just in case. That would make losing a ship just a little less painful. (Gold farmers I hate too, but at least I can understand the reasons behind their actions. They’re trying to make money by spamming, ripping off accounts, and gold, and wasting our support/dev time, which is unethical and borderline evil but at least rational. I really suggest not buying gold from them if you actually care about such things). "On the point of gold farmers, I would be more careful with my language. If you call them "gold farmers", I don't consider their actions unethical or evil. Annoying, sure, but as they never actually accepted the premise of the game as being *a game*, but consider it as a form of making a living, I have a hard time condemning them. They don't "cheat", because they don't play, they work. Of course as soon as we talk about "account hackers", which is not totally the same thing even if there is obviously an overlap, we clearly get into the domain of illegality. But somebody who is just farming gold, with or without bots, and then selling it, with or without spam, isn't breaking any real world laws. In fact a gold farmer quite frequently does exactly the same actions as a regular player in need of gold, only they do it more intensively." Gaffney did not use the term "gold farmers" accurately, at least according to Wikipedia. "Gold farming is playing a massively multiplayer online game to acquire in-game currency that other players purchase in exchange for real-world money." The activities he mentioned don't really involve gathering gold in-game like an actual gold farmer would. I agree that Gaffney should not have used the term gold farmer. Notice I just want Gaffney to change is terminology; I like the way he thinks. So what term should he have used? In connection to Wildstar, gold seller, my preferred term, probably isn't good either. Why? Because CREDD, at its core, is just Carbine establishing a primary RMT market for the exchange of in-game currency for real world cash. Although if everyone agrees to separate the primary RMT market (CREDD) from the secondary RMT market (gold selling outside the CREDD system), then gold seller is probably okay. Perhaps people should just use the term RMTer. I'd suggest cupcake, but that's already taken. The genesis of this post comes from Dirk MacGirk and his continued ranting on EVE Radio over the three part CZ Minutes feature that ran on Crossing Zebras 8-10 June. The head editors of Crossing Zebras, The Mittani.com and EVE News 24 came together and produced an 18,000 word epic on the subject of EVE media. I think Dirk, himself a contributor to EVE News 24, is a little taken aback at their assumption of superiority over the bloggers, forum posters, and EVE Radio that was conveyed in the articles. While the term "elite" was never mentioned, Xander Phoena, the man in charge of Crossing Zebras, did use the term "Eve media triumvirate" in part 2 and TMC editor-in-chief Tegiminis referenced "the big three" in the final installment. Personally, I'm not bothered by such talk coming from any of those sites. Then again, my opinion is possibly influenced by the fact that I was once syndicated on EVE News 24 and wrote 2 articles for TMC. But think about the situation. Why shouldn't those sites have great content? More importantly, why shouldn't the editors-in-chief and those who run the sites not only think they put out superior content, but expect that level of writing from their staffs? Staffs. That's important. How is any individual blogger going to produce work comparable to what a site with a staff of writers with editor support can produce? A blogger can outperform in a narrow niche, but across the wide range of topics we see on those three sites? If the sites are competently run, not a chance. Aside from people like Ripard Teg and Sugar Kyle, most bloggers will only produce a maximum of one post a day, and only 5 days a week. A features writer on TMC or Crossing Zebras has seven days to work on a piece, which means that much more time to research an article than a blogger typically possesses. But why would a blogger go up against the strengths of these news sites. Instead, why not go after where sites like these are weak? In my opinion, I see three weaknesses. The first is follow-up. These sites, especially EN24 and TMC, have the resources to regularly get to the story first. But I rarely see any follow-up. A blogger can make a living on that. Some may even say I make a living on that, or could if I monetized the blog (ugh!). Going back and looking at a situation two or three months after the fact is old news for the big sites, but oftentimes holds interesting stories. The second is the desire for hits. Sites that rely on advertising revenue (which excludes Crossing Zebras) will favor sensational stories (i.e. click bait), some developing stories will fall through the cracks until the stories explode. But if a blogger can identify the story and become an expert, that blogger can write better quality posts than "the big three" when the story finally explodes. The third is the way that writers are paid. They are paid by the piece. The more articles a writer produces, the more ISK in his or her wallet. Even with editors in place, that leads to holes in stories that bloggers can fill in. I don't see the emergence of two or three main sites in EVE as a bad thing. Instead, I see the situation as an opportunity. So to anyone thinking of EVE blogging, jump on in, the timing is pretty good. The Xfire community's shrinkage continued on Sunday, with members spending 4.1% less time playing MMORPGs than the Sunday before. I'll break off from the usual format, as I have something to say about that later in the post. Technical Difficulties - While Wildstar is enjoying a great start, the game is experiencing some technical difficulties that sometimes keeps players from logging in. That could account for some of the decline in Wildstar's numbers this week. But the trend is a bit disturbing for launching less than two weeks ago. E3 Excitement - Did Final Fantasy XIV producer Naoki Yoshida make a big splash at E3 this year? Not only did he announce a new Ninja class coming in the 3.0 expansion, but patch 2.3 is due to launch on 8 July. I get the feeling that E3 introduced some excitement to the game's fans and they displayed it on Sunday. Why Not Raptr? Regular readers of this weekly column know that Xfire is rapidly dying. Don't believe me? On 12 February 2012, the date I published the first column, Xfire members spent 176,521 hours playing the twelve most popular MMORPGs on 10 Feburary 2012. Twenty-eight months later, that number had declined 89.6% down to 18,243 hours. To give another example of how the Xfire community has shrunk, the only game this week that exceeded the 12th place game in the first list was World of Warcraft. In fact, five times more time was spent playing WoW on 10 February 2012 than was spent playing the top 12 MMORPGs on Sunday combined. "Copyright. The Site, the AMD App, Raptr App and the Service are protected by U.S. and international copyright laws. Except for your use as authorized above, you may not modify, reproduce or distribute the content, design or layout of the Site, the Raptr App and the Service, or individual sections of the content, design or layout of the Site without Raptr’s express prior written permission." I am reading that as including making a column based on Raptr data obtained from the site. As Raptr actually makes money from selling the data it collects from players, they probably would look unfavorably on me distributing that information freely. So, no Raptr data here. Is my use of Xfire data treading a fine line? Possibly, but I think I'm on the right side of it. But at this point I doubt I'd get sued because Xfire needs all the publicity it can get. The winners of the election for the 9th Council of Stellar Management were announced at Fanfest on 3 May. Perhaps six weeks is too short a time to look into its performance, but I think I'll do so anyway. First, the opinions of the various individual CSM representatives seem more varied, and more public, than in CSM 8. Perhaps I relied on reading Ripard Teg's blog too much, but I just seem to hear more from the individual members in the first six weeks with the current body. Mike Azariah continues to post out of character on his blog as well as hotdrop podcasts and Eve Radio shows faster than Pandemic Legion descends on a ratting carrier. Ali Aras is still holding her excellent Space Hangouts every two weeks on Google Plus as well as the CSM segment on the Declarations of War podcast. But we have some new voices as well as four representatives are blogging regularly about CSM related matters. Sugar Kyle continues to rival Ripard's legendary output on her own blog while elite EVE media mogul Xander Phoena also does a weekly CSM roundup. DJ FunkyBacon and mynnna are also producing regular content, which provides their thinking about the direction of EVE. Major JSilva is becoming a regular fixture on the BigCountry talk show on Eve Radio at 0000 Wednesdays EVE time while Corbexx is also active. Both made appearances with Sugar Kyle at an event hosted by Eve University on 8 June as well as appearing on the Cap Stable podcast with CCP Falcon and CCP Leeloo. I hear that Corbexx is active on the social media popular with wormholers, which might explain how I've missed most of what he is doing on the communications front. On performance, I think that CCP's move from a 6-month to 6-week deployment schedule for EVE Online will keep the CSM hopping. Building on the momentum established by CSM 8, CSM 9 has already held more meetings with CCP development teams than CSM 8 had at a similar point in time. Actually, the current CSM has had as many meetings, with as many teams, as is typically held at one of the bi-annual summits. In addition, CSM 9 has had an impact on the content pushed out already, particularly the freighter changes in Kronos. I'm pretty sure that the CSM was consulted on moving the industry changes from Kronos to Crius, but I don't know for sure. The "no officers" model I think has also had an impact on how the CSM reacts to out-of-game events that impact the game. In the past few CSMs, the CSM tended to speak out with one voice on controversial issues involving CCP. Not this edition. When layoffs occurred on 5 June, the public reactions ranged from diplomatic to hopeful to anger. Interestingly enough, the reactions didn't really contradict. Xander's hopefulness that any restructuring will improve CCP and EVE Online does not conflict with DJ FunkyBacon's anger and disgust that such restructuring was required in the first place. One other interesting thing about the "no officers" model and the reaction to the layoffs. CSM 9's decision to not have officers would not have changed the CSM's reaction, as both CCP Dolan and CSM 8 had agreed not to elect officers until the Summer Summit. So CSM 9 would have acted without a formal leadership structure anyway. I should point out that, as an outside observer, CSM 9 does not seem as much in lockstep as CSM 8. I've seen hints of the disagreements in various weekly updates and blog posts by the various CSM members. Mike Azariah, on the latest Crossing Zebras podcast, confirmed that the debate is more lively than in CSM 8. Adding two strong low sec personalities like Sugar Kyle and DJ FunkyBacon might do that. Throw an industrialist like Steve Ronuken in the middle of an industrial revamp and I'm sure the discussions get rather lively. That could relieve the concerns that the CSM is dominated by null sec interests, although we will need to wait and see what emerges from the next few releases. Overall I'm pleasantly surprised by the performance of CSM 9 so far. I thought that I'd have to wait a lot longer to see results, but this group of representatives has hit the ground running. Hopefully the enthusiasm displayed so far will continue. In a game in which players love graphs, perhaps the most famous is found on one of Chribba's many websites, Eve-Offline.net. Many people, myself included, have used the weekly average concurrent users graph to interpret how players respond to events in EVE, or just to give a general sense of the health of the game. But I'm not sure how many posts exist discussing the graph itself. Each server cluster that CCP runs has its own API that Chribba uses to display the concurrent number of users. These end points only supply the numbers for that cluster and no others. Chribba not only displays the number of current users logged in, but the number of peak concurrent users over the past day, week, month, 3 months, and 6 months. And, of course the average concurrent user graph. One fallacy that has emerged, due to some shenanigans performed by CCP in regards to the user numbers displayed in DUST 514, is that the current user number displayed for Tranquility on Eve-Offline.net combines EVE and DUST 514 together. I checked with Chribba and that is not the case. Also, checking the data at the time DUST 514 went on-line confirmed that. The average number of concurrent users did not magically jump by thousands one week. The above graph shows the weekly average number of concurrent users on Tranquility since March 2006. Each of the data points, as far as I can tell, represents the midpoint, not the start, of each week. The last data point in the current graph is 5 June 2014, but the next update won't occur until Monday, when the 12 June 2014 data point is added. Now, I know what some people reading this are thinking. Do do they get their hands on this data? The people who love a challenge will probably go out and try to get the data from the EVE API. I'm not sure that really works, as I don't know how much historical data is available. I'm pretty sure the weekly average is calculated and stored locally in one of his databases. So instead of reinventing the wheel, I always use the data in the graph. Then just take the data and format as desired. 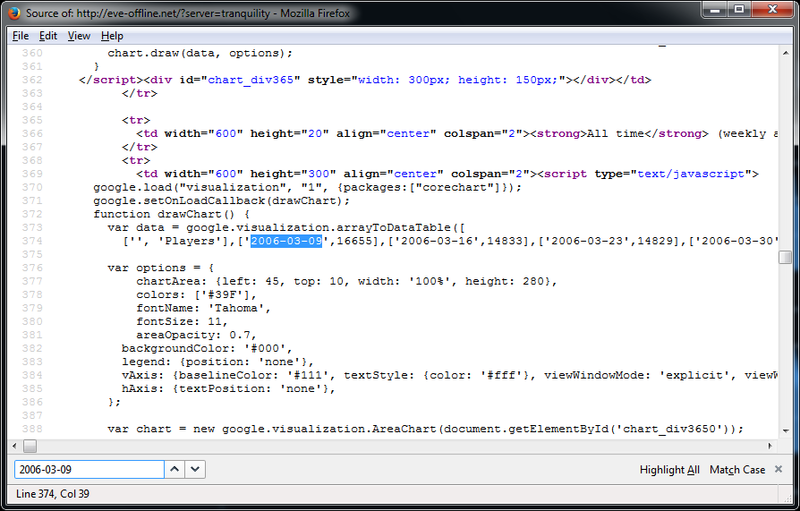 I copy the data from the browser into a text file and use a VBScript file I wrote to format the file so I can easily copy/paste the data into Excel. Or just use something better. I use VBScript because it comes pre-installed with the Windows operating system (including Windows 8). Hopefully I still have the script. That's a brief overview of the famous graph and the data it displays. I don't know if anyone is actually interested, but I figure I'd write a post explaining how I get my average concurrent user data. And for those wishing to use the data, please credit Chribba, OMG Labs, or EVE-Offline.net. I usually credit all three. Okay, that's the official written policy. Over the years, some exceptions were made for industrial use, but in general, if someone is beating me 1 vs 1 in EVE, I know it's my own lack of skill and knowledge about how to play the game, not because the other person is running better macros.1 But that's not the case in most of the games I've played. In my first MMORPG, World of Warcraft, I used to run around Alterac Valley on my paladin using an add-on called Decursive.2 The add-on allowed me to remove negative affects from my team just by spamming buttons. I didn't need to target anyone. Just spam. I found the add-on useful because it allowed me to influence events before I could reach the scene of the action and participate in the fight directly. Near the end of my time in WoW, though, I soured on the use of add-ons like Decursive. The incident that still sticks out in my mind is running into someone in Silithus who complemented me on how good I was. But that wasn't me, that was a bit of code that I found and imported into the game. At that point I felt like a fraud. Just because I had the bad experience in WoW didn't put me off from writing macros. Everquest 2 has a macro system and I created some macros. The most complicated one involved switching between my combat gear and my crafting gear. But I never did download add-ons for EQ2. I'd like to say for philosophical reasons, but the biggest thing that turned me away at first was SOE's monthly deployment schedule. Did I really want to wait a day after every patch for an add-on dev to patch his add-on? During that time, a player gets exposed for relying on outside software. Why have that happen when I could just learn how to play the game the way the devs intended? I think three years of that mindset really prepared me for playing a game without macros/add-ons like EVE. "The purpose of Ayth_Quest is to show you the closest objectives for your quests, quest givers, harvesting/farming nodes, and path objectives. The inclusion of path objectives and harvesting/farming nodes is rather new to Ayth_Quest so they may not work 100% as intended. I know my settler doesn't get any lines drawn at all for it's objectives, but Aytherine is constantly updating this addon and I'm sure it'll get all paths working soon. As you can see in the image below, Ayth_Quest shows you which objectives are the closest by overlaying dotted lines that point you right where you need to go with the distance also thrown in for good measure." Basically what the add-on does is give you the same functionality that is built into Neverwinter. That is, a path opens up to the mob a player needs to kill or a resource a player needs to gather. No looking around required. Some might even say the add-on dumbs the game down. Perfect for those looking to reach the Elder game (what Carbine called end game), but designed to make me unsub from the game quickly. For me, if the choice is raiding or quit, I usually quit. But is that really the way the devs designed the game? Feels like cheating to me. But ... it's not. In fact, players will mark down games if the game developer does not allow player-created add-ons. At one point, I found the situation humorous when WoW players who never played with the Blizzard UI extolled the virtues of the Blizzard UI. In their minds, using a player-designed user interface meant that Blizzard did something right, not that Blizzard failed at UI design. In Wildstar, I most likely will play with the macro system. I think having a macro to wave to someone fits in with playing an Exile. Unlike those stuck up Dominion types, we're friendly.3 But I really don't want to download any add-ons. Carbine is planning a monthly patch and I don't want to get locked out of playing because any of my add-ons need updating. I'd rather learn to play without relying on the add-ons. Waiting for a patch to download is bad enough, I don't want to wait any longer than that. I'm impatient that way. 1. Yes, I know about ISBoxer. I also believe that this is one of the reasons people don't like the use of ISBoxer. Who likes getting beat by software? Especially when that software technically violates the EULA. 2. This was back in Vanilla WoW, so I may mis-remember the name, but the functionality was the same. 3. Not to say that the Dominion can't use emote macros. People playing Chuas probably need at least 5. On Tuesday morning, I did something I had never done before. I decided to mine right before downtime. I didn't plan to. I went to bed a little early on Monday and as a result woke up a little early on Tuesday. I looked at the clock and saw I could get an ore hold and a half of ice before downtime and decided to go for it. The way liquid ozone has sold in Bosena lately, I figured I could pick up an easy 5 million ISK or so. The first part of the plan went off without a hitch. I logged both Wandering Rose and Rosewalker in, set up Rosewalker in a perch observing the ice field, and warped Wandering Rose in to start mining. Twelve cycles of uninterrupted bliss. Twelve cycles where I was the only one in system. Doesn't happen very often. While Wandering Rose was in station emptying her ore hold, I started to see traffic. But the ships never showed up in d-scan range and exited local in short order. I figured downtime was in a few minutes and everyone was docking up. So I decided to undock and get another 6 units of ice. Undocking was probably not the smartest decision I'd ever made. Because about then a pilot who always seems to enter any of the local systems about 15 minutes after Wandering Rose showed up in local. Then another pilot, this one in a one-character corp, appeared in local as well. But I went ahead and started mining anyway. Now, with downtime so close and with the changes to the Procurer making mining while aligned more difficult, I got a little lazy. So I decided to just point at a celestial and not actually align. Aligning now is such a pain that I decided to risk it. After all, 5 minutes until downtime and no one on grid. Who's going to come visit? This guy. Looking at the kill board, Mr. Ryan has taken up residence in my little area of low sec and is taking on all comers. Including yours truly. So he warped in 11 km from me and immediately got tackle. Either I've gotten sloppy noting the warp in points, he had a bookmark set up, or his alt was flying a cloaky and provided a nice warp-in point. For his Cynabal. Yikes! But at that point, downtime was in 3 minutes, 11 seconds. I'll admit, I was a bit alarmed by the situation. But not too much. After all, the Procurer's drone bay was expanded to I could fit two flights of drones in Kronos. So I sent out my flight of EC-300s to jam his ship and warp away. Except my drones died very quickly. I guess that plan didn't work out so well. So there I was, slowly dying. But not too fast. So I kept on task and continued ice mining. Hey, I needed to pay the repair bill and to replace the drones, right? Okay, I have a stash of 150 EC-300s that I built a few months back, but it's the thought that counts. With downtime closing, and my first chance to see a Cynabal up close distracting me, I finally realized that I could actually shoot back. Not with the flight of tech 2 drones I still had, but with a stealth bomber! So I warped Rosewalker into range, lit up the Cynabal with a target painter, applied damps, and started firing off torpedoes. I also aligned toward a celestial, but Mr. Ryan had no interest in chasing after a Hound when he had a nice Procurer kill sitting in front of him. So this was the situation at downtime. Mr. Ryan pouring 220mm Autocannon II and Federation Navy Hobgoblin fire into my Procurer for all he was worth. Rosewalker plinking away at range with torpedoes. And Wandering Rose getting that 18th unit of ice into the ore bay with seconds to spare. OP success! When the servers came back up, Mr. Ryan logged in and collected his drones. I logged Rosewalker in as a scout to determine when Wandering Rose could log back in safely and ran around the house getting ready for work. Eventually, Mr. Ryan got tired of the game and went away. I waited until I was alone in system and logged Wandering Rose back in. Only down to 96% structure and I didn't have to overheat anything. So after docking up, I paid the 52,000 ISK repair bill, logged off, and went to work. This little escapade, while eventually harmless, did teach some lessons. First, don't let my guard down. Ever. Next, I need to do a better job of intelligence gathering. Instead of just looking at corp/alliance affiliation and security standings, I need to start keeping a book on the pilots I see in local. Not in minute detail, but Eve Who is a valuable resource. I should at least use it to look at kill boards. If I had, I might have seen Mr. Ryan really likes to shoot things. And that's he's pretty good at target selection, since he hasn't lost a ship in weeks. On the business front, I really need to pick up three Procurers. I have my eye on three systems with ice sites that are much more convenient than where I mine now. The only advantage of my current location is the security status. I currently mine in 0.1 & 0.2 systems because the ore in the belts is better. The locations I'm looking at are 0.3 & 0.4 systems. Maybe I can make the changes in Kronos work for me and hope that the new ore sites actually spawn in those new systems. I've already got maximum refining in two of the systems. The third only has a Gallente station in it, so last night I started another standings grind. The grind from 2.2 to 6.67 should provide lots of loyalty points, which means I could add to my product line. Or maybe just purchase implants for myself. Depends on how I feel when I reach my goal. On the sales front, I wonder if I stumbled into a market opportunity. I've hesitated in putting up a mini-mart in my area because I didn't want to attract PvPers. But the PvPers have shown up. So why not? I'm sure some of them might like some nanite repair paste. I bet Mr. Ryan was overheating his weapons trying to kill me. If I was selling nanite repair paste from my factory station, I could have made are real nice profit. The same with ammunition. If I expand the number of systems I have Procurers in from 5 to 8, including finally systems not in Metropolis, then I'd feel better about attracting people to my current area. I'll have to look into the possibility more. EVE is definitely a funny game. I may alter the way I play the game just because one morning I woke up a little early and someone in a one-character corporation tried to gank me while ice mining in low sec. But the changes not only look like a challenge, they look like fun. A lot of work to set everything up the way I want, but fun at the end of the day. Something tells me I'll unsub Wildstar once I hit max level in that game. EVE just got a lot more interesting to me. The rankings of the top twelve MMORPGs as determined by the players of the Xfire community from play on Sunday, 8 June 2014. For more details about the methodology, click here. Historical data can be found here. After a Wildstar-fueled resurgence last week, the Xfire community's interest in MMORPGs waned again on Sunday. The 7.6% decline in the number of hours Xfire members played their favorite games was led by World of Warcraft (-961 hours) and Wildstar (-551 hours), while EVE Online (+383 hours) was notable for its fans increase in playtime Sunday. RIFT and Neverwinter fell off the list this week, replaced by Lord of the Rings Online and Maple Story. Is There A Problem, Cupcake? - Last week I pointed to the seven games with the most successful starts on The Digital Dozen and pointed out that only one, Neverwinter, had a decline in its Digital Dozen score the week after it launched. Now add Wildstar to the list. While remaining #2 on the list, the Carbine game saw its score fall from 20.3 to 19.1. Is this a sign of trouble? Or just the result of launching the early access period on a Saturday? Time will tell. Head-to Head - CCP decided to launch its Kronos release for EVE Online on the same day as the official launch of Wildstar. The result? Xfire players returned to New Eden, with the number of hours spent in space increasing by 56.2% Sunday. Will a speeded up release schedule of six weeks instead of six months keep Xfire members logging in? Double-checking The Numbers - The success of the Wildstar launch highlights the continued struggles of Elder Scrolls Online. Last week marked the end of the first billing cycle for those who participated in early access and the number of hours spent by Xfire members playing the Zenimax game took another tumble. I double-checked the Xfire numbers with the numbers on Raptr to see if people really were spending 5.3 times more hours playing Wildstar than ESO. According to Raptr last night, Raptr members spent 571,257 hours playing Wildstar over the past 7 days as compared to 100,445 hours playing ESO (5.7 times more hours). So the difference is actually greater on Raptr than on Xfire. In EVE Online, pretty much everything runs on ISK. Some people even evaluate the amount of ISK per hour they can earn to decide whether to do an activity. If everyone did that, some things wouldn't get done, which indicates some people play a little differently. Brave Newbies, for instance, famously looks at fun per hour as a metric for doing something. I don't know how that mindset is working for them in player-owned null sec, but their number one goal is to have fun. As EVE is, despite some of the marketing hype, a game, many players play just to relax and get away from the cares of the real world. For some, that just means going to a high sec belt and turning on the mining lasers. For me, I turn to running courier missions. Courier missions, for those who don't know, involve moving packages from one station to another. Talk to agent, put package in the cargohold, travel to not-to-distant station, and talk to the agent again. Collect ISK and loyalty points. Pretty mindless, except for the watching the grid for hostile ships, especially Broadswords. Which, considering I run all my courier missions in low sec, basically means any other ship. I think the important part of relaxing is controlling the pace at which one plays a game. That's why I find the challenges in Wildstar are so startling and irritating. Here I am, wandering around, sightseeing, gathering ore and Settler materials, killing mobs and completing quests at a leisurely pace, and some over-the-top announcer type proclaims a challenge. A challenge, while giving out rewards, demands that I race to do a task that often keeps me from progressing in the other five tasks the game has set for me. Challenges are involuntary and I have no alternative to just waiting for the timer to run out. What gets really irritating is when I'm told I failed the challenge. How can I fail to do something I didn't even try to accomplish? Aargh! At this point, some EVE players may find the thought of a game smack-talking players a pretty cool feature. Of course, to get the full effect requires voice acting, and I don't think CCP is going to spring for that. I should add that the comments I hear when I rez after another stupid death are sometimes pretty funny, which helps with the whole relaxation effect I'm usually going for when playing games. And the announcer's descriptions of a new zone I've found are always entertaining. But sometimes I just want the game to stay out of my way and let me play the way I want. I find setting my own pace much more relaxing. I think that yesterday's news of CCP laying of 49 more employees, including some working on EVE Online in the Reykjavik office, should end the debate on whether EVE Online is losing subscriptions. From the marketing department not touting EVE Online growing for 11 years at Fanfest to declining average concurrent user number to deflation in the economy, most of the signs pointed to EVE Online losing subscriptions over the past year. That's it. Even the giant of the industry, World of Warcraft, only managed six years of growth before its numbers started to decline. Quite frankly, I think 10 years is a mark that no MMORPG will ever equal, at least in my lifetime. I spent way too much time since the launch of Kronos explaining how Procurers were nerfed. A lot of people look at the 50% bonus to drone damage and hitpoints, doubled drone bay, increased targeting range, and 77.8% increase in velocity (from 90 m/sec to 160 m/sec) and figure the ship received a massive upgrade. Perhaps for PvPers. But for players concerned about using a mining barge for mining? I knew after attending both the Economy and Security presentations that something was about to happen to the price of illicit ISK. I just didn't know what. So in addition to my normal monitoring activities, I started watching Player Auctions3 again, collecting what daily statistics I could. The rankings of the top twelve MMORPGs as determined by the players of the Xfire community from play on Sunday, 1 June 2014. For more details about the methodology, click here. Historical data can be found here. Sunday saw a big increase in interest by the Xfire community in its favorite MMORPGs. The 16% increase in time spent playing these games was spurred by the early access launch of Wildstar over the weekend. Many games saw a decrease in interest as a result, led by Guild Wars 2 (-399 hours) and Final Fantasy XIV (-231 hours). In addition to Wildstar, RIFT jumped back into the Digital Dozen after a four-week absence. The games falling off the list this week were Metin 2 and Maple Story. Measuring Success. So how did Wildstar do with Xfire members during its early access weekend? I went through the records of the past two years and pulled information from the launches of several other games. The score is the Digital Dozen score for either the first or second week of a game's launch. The rank is the game's ranking in the Digital Dozen for that week. The Digital Dozen score helps normalize the rankings over the past two years given the declining membership of the Xfire community. According to the Digital Dozen scores, Wildstar had the second most popular launch among the Xfire community since February 2012. Only Guild Wars 2's highly successful debut in August 2012, when it vaulted past World of Warcraft, received a warmer reception. The score promises to get higher next week on the first Sunday after the full launch today. Of the seven previous games listed, only Neverwinter experienced a drop in interest the second Sunday. Neverwinter did experience a disastrously exploit-ridden launch in which the in-game economy was crippled right at the start. Barring news like that, I expect Wildstar to solidify its great start next week. Blizzard's Magic. Hidden in the news about Wildstar, World of Warcraft actually experienced a 5.4% increase in playtime on Sunday. What gives? Was it the patch released last Tuesday? Maybe the excitement over the in-game mount competition and the voting that started on Friday? Or perhaps players were excited at the chance to purchase the Armored Bloodwing mount and Blossoming Ancient pet for 35% off (offer good through 11:59pm PDT today). The cynical might claim that due to the queues in Wildstar, a lot of players logged into WoW instead. Whatever the reason, WoW did not see a decline in interest Sunday. Will that trend continue next week? Hello everyone. I've put this post up as a placeholder due to my Tuesday column somehow getting published due to a hardware issue. There was a nut loose on my keyboard. That said, for those interested in EVE Online's Xfire numbers, the number of hours played by the Xfire community has declined by 33% over the past two weeks. Hopefully that will tide everyone over until the actual post comes out tomorrow. Over the weekend I participated in the Wildstar early access period. Participated probably isn't the right word. I spent 16 hours over two days playing the game, according to the /played command. I set aside the weekend for playing Wildstar, but I didn't realize how much I played. But Carbine made playing that much relatively easy by allowing those who had pre-ordered the game to perform the download ahead of time and to launch at 0700 GMT (midnight in California).